Commercial security affects a number of development-related factors, such as the capacity of states to govern, overall feelings of public safety, economic growth and social welfare. 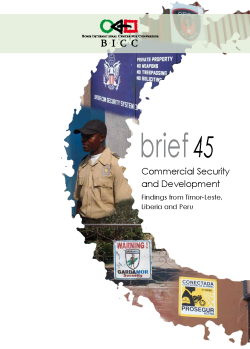 Findings from field research in Timor-Leste, Liberia and Peru indicate that the relation between commercial security and development is highly ambivalent. Security markets can foster economic growth and ease the burden on the back of the public security sector. Nevertheless, weak regulation of commercial security practices has created problems. These include low-level conflicts between public and private security providers over policing authorities in particular surroundings. Moreover, a trend toward the corporatization of private guarding has engendered extremely exploitative labor relations in the security industry. In the worst case, security firms may even commit frequent human rights abuses, thereby directly undermining any wider sense of security in society. From a development-policy perspective, these findings are all the more pertinent, since international development organizations themselves are often the largest customers of security companies.